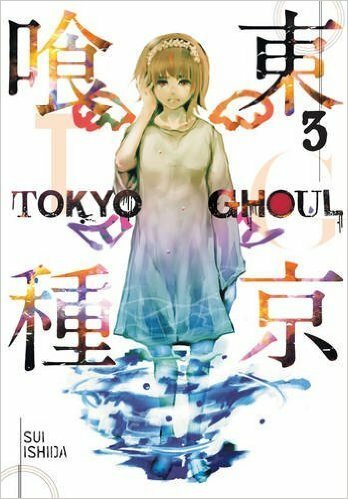 Tokyo Ghoul 3 follows the story of little Hinami who suffered a major loss in the previous volume. Her safety has also been compromised – Commission of Counter Ghoul agents are trying to sniff her out since they have a description of her. In an attempt to protect her and sabotage the investigation, Kaneki and Touka dress up as high school students and walk right into the anti-ghoul agency to give a few tips on Hinami’s alleged location. Kaneki’s suspicious nervousness almost blows their cover when a top agent finds something odd about him. Fortunately, Ken’s half-human side spares him from death and the two ghouls escape unharmed. Little Hinami falls into a deep depression and runs away from the safety of the ghoul cafe. Kaneki and Touka try to find her only to discover that Hinami ran right to the place where they earlier told agents to investigate. Things get violent and Touka is left to defend Hinami while Kaneki tries to prevent reinforcements from showing up. Kaneki doesn’t kill the agent he faces off with and begs him to run away since he doesn’t want to become a murderer. In this battle he makes his first attempt to try to get humans and ghouls to understand each other so they can exist together. I have to admit, it feels like it has been a really long time since I read volume 2. So long, that I really didn’t remember too much and I worried that I already forgot about the series I was quickly falling in love with. Fortunately, volume 3 is written in such a way that I was able to recall everything that happened in volume 2 without needing to look back to refresh my memory. As I read further, the gap closed and I soon found myself completely immersed in the story of Hinami and the prejudice humans have against her simply because she is different. Instead of seeing her as an orphan who has suffered a major loss, her death is viewed as a trophy by the anti-ghoul police who hunt her. Human society really believes ghouls are monsters and no one is willing to see Hinami as a little girl with a right to live. This volume is gripping and written really well. It wasn’t a disappointment in any way and I can’t think of a single flaw. If you haven’t started reading Tokyo Ghoul, you really need to start right now.